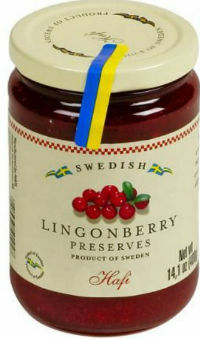 Delicious Swedish lingonberries are loved by millions! Perfect with meatballs, pancakes, waffles, toast and much more! Ingredients: Wild lingonberries, sugar, pectin, citric acid, potassium sorbate. Total Carbohydrate 8g - Dietary Fiber 0g - Sugars 8g - Protein 0g. NOTE: Best Before Date Format is Day-Month-Year. Our legendary parent company, Nyborg & Nelson, was established 97 years ago in the USA. Well trusted, Sweden's Best earns Yahoo Store's 5-Star Top Customer Rating. Sweden's Best is a Secure Yahoo Store. Great prices, sales and discounts. Copyright 2017 Sweden's Best. All rights reserved.